In Taiwan, pineapple cake is a fav. So is the iPhone. So what do you get when you mix the iPhone with that tasty pineapple pastry? You dial up delicious town. Taiwanese bakery Comte redesigned its pineapple pastry to look like the iPhone's packaging and dubbed it the "iFong" (a pun on "fengli"). 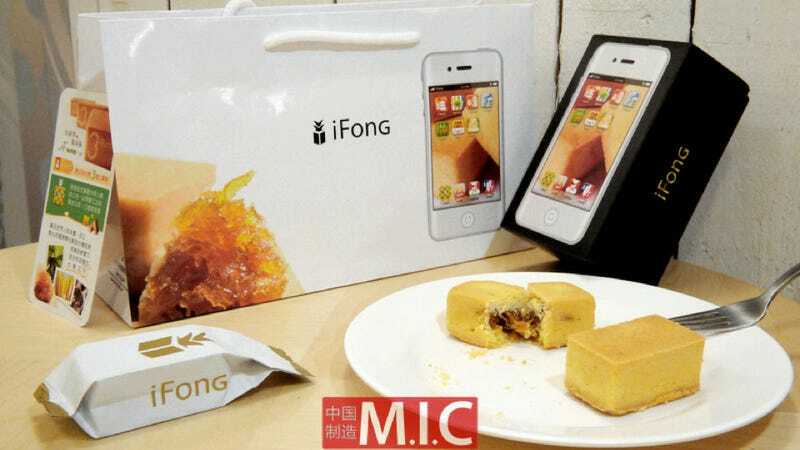 Website MIC got its hands on an iFong and noted that the packaging's "apps" read: "Good Luck Comes, Sweet and Sour Just Right, Egg and Milk Food, 20 Days of Taste, No Mixing of Winter Melon, 100% Fun, and Pure Handmade." The "6G model" comes with six pineapple cakes, which are made fresh and without preservatives. Since they are all natural, the iFong cakes will go bad after two weeks. Called fengli su ("鳳梨酥") in Taiwan, pineapple cake's name means, "to bring wealth". The square pastry snack has a shortbread style texture on the outside. On the inside, however, it is usually filled with pineapple jam. Though, the filling can range from honeydew melon to chicken! Comte is planning on launching the iFong 2 soon and is expecting foodies to line up over night to get their hands on these tasty looking treats.